NASA has conducted a landmark test of a booster for its Space Launch System, the first heavy-lift rocket since the Apollo program ended in the 1970s. Working with Orbital ATK, NASA believes the booster will eventually help land a manned aircraft on Mars. At 11:30 am ET, the 177-foot, five-segment QM-1 rocket motor was fired on the ground while lying horizontally, according to reports. The two-minute test took place at aerospace company Orbital ATK’s Utah test facility, marking an important step for the Space Launch System (SLS). "I am very happy," Alex Priskos, manager of the SLS Boosters Office at NASA's Marshall Space Flight Center in Huntsville, Alabama, said on NASA TV. "Great test. Just a fantastic result. ... This thing was about as perfect ... as it could be." The QM-1 weighs 1.6 million pounds. Prior to Wednesday’s test, it was predicted to burn 5.5 tons of solid fuel, producing 3.6 million pounds of thrust. NASA wants to build on this test in order to use the SLS to launch its Orion spacecraft to an asteroid -- then, someday, to Mars. Orion completed a 4.5 hour test flight on December 5, with cameras on board recording the views from space when travelling back to Earth. 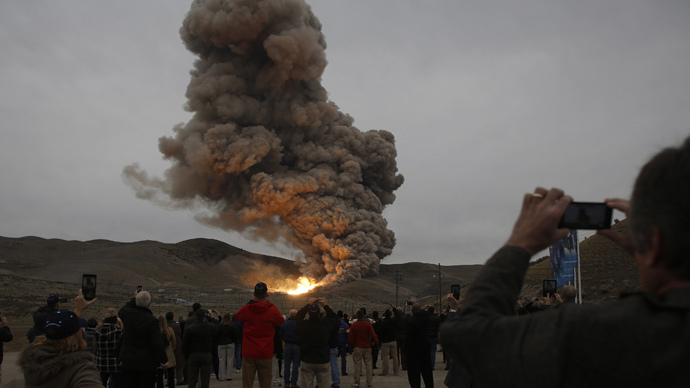 Another booster test is planned for 2016, NASA officials said. The first test flight for the entire SLS is set to take place in 2018, and its first manned flight in 2021. During the first two SLS flights, the craft will be able to carry 70 metric tons of payload to low-Earth orbit. That payload demand is eventually expected to rise to 130 metric tons, thus allowing manned missions to areas such as Mars. After 2018, the US Government Accountability Office says that “future mission destinations remain uncertain,” according to The Washington Post. Meanwhile, later Wednesday, NASA astronaut Barry "Butch" Wilmore and Russian cosmonauts Alexander Samokutyaev and Elena Serova will depart their orbiting lab on the International Space Station (ISS) and arrive back on Earth after their six-month mission, known as Expedition 42. They will leave the Soyuz capsule at 6:44 pm ET (2244 GMT) and land in Kazakhstan at 10:07 pm ET (0207 GMT on March 12). Their departure will leave Expedition 43 leader Terry Virts, NASA astronaut, Russian cosmonaut Anton Shkaplerov, and Italian astronaut Samantha Cristoforetti at the ISS until March 27, when they will be joined by three people. Two of them, American Scott Kelly and Russian Mikhail Kornienko, will become the first people to stay aboard the ISS for one continuous year.